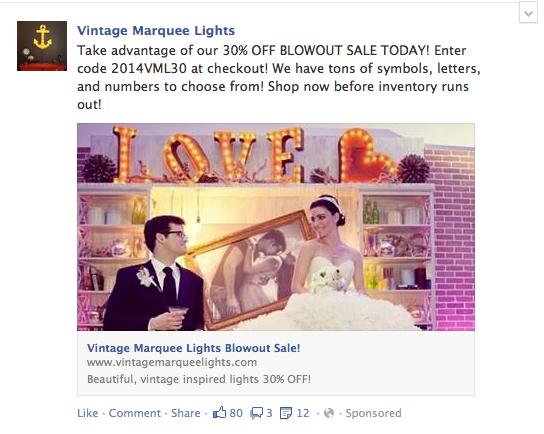 Facebook advertising is more sophisticated than it was a year ago, or even 6 months ago. When advertising was first introduced to the platform, Right-hand Side Ads were the only option, but now the options are almost endless (at least with the various types they seem endless!). What kind of content do you have at your disposal? What kind of content does your target audience engage with the most often? How do you want users to change with your content? These are the traditional ads provided by Facebook that allow advertisers to get in front of users who are on their desktop devices. The important word here being…DESKTOP. They aren’t served on mobile devices, so if you’re trying to reach people when they’re on the go, this is not the best option for you. Also consider that at the end of January 2014, Facebook mobile users surpassed desktop users. Right-hand Side Ads work well as a means of awareness and continuity for the rest of your campaigns – they’re a great way to keep your brand and message top of mind throughout your campaign. With a platform like AdRoll, you can use Right-hand Side Ads to retarget users and get them back to your website or landing page to achieve higher CTRs and engagement rates. Recently, Facebook changed its algorithm (EdgeRank), making it nearly impossible for brands to appear in a user’s News Feed without serving an ad. So, if you want to make sure your post gets seen, you’re going to need to put some money toward it. The good news is that promoted posts (when done correctly) are very engaging and see low CPCs. There are two different types of Promoted Posts to use for different purposes. Image Promoted Posts used to be the only option for Promoted Posts. This was based on the knowledge that users interacted with image posts more often than link or text posts. In fact, photos on Facebook generate 53% more Likes than the average post. So if you’re looking for user engagement in the form of page Likes, post Likes, comments, or shares, Image Promoted Posts are a great way to go. The one downside to Image Promoted Posts is that you cannot ensure a click to your landing page or Facebook tab with one of these posts. When a user clicks on the image, he or she is taken to a larger version of the picture, not to your website, so there is no way to guarantee that a user actually gets to your site. When bidding on a CPC basis with these posts, you aren’t paying for a click to your landing page, you’re paying for a bigger image view. The best way use Image Promoted Posts is to increase your Page Likes or interactions with your brand in general, as they garner more shares and Likes (in my experience) than any other format. A month or so after Facebook introduced the new link post format with much larger images, they also introduced Link Promoted Posts. Like Image Promoted Posts, Link Promoted Posts can be served to users on both mobile and desktop devices and are best used for directing users to another landing page or Facebook Tab, because no matter where a user clicks on your post, he will be directed to your landing page. In that vein, if you’re measuring success by the amount of leads your campaign as generated, or entries your contest received then Link Promoted Posts are the most efficient use of your budget. Facebook has also introduced Cost Per Action bidding, which allows an advertiser to pay only when a user has visited your website or when a user completes some pre-determined action (like filling out a form). In my experience, though, the average cost per action is much higher than your average cost per click AND Facebook will generally serve fewer impressions of your ad because they’re not guaranteed to make as much money off of it. There are a few other ad types I haven’t mentioned, like Page Like Ads & App Install Ads. As their names suggest, Page Like Ads are used to help you generate more Likes to your page and App Install Ads (allowed only on mobile devices) are used to advertise a new app to user. The best campaigns use a mixture of all of these ad formats (except for the App Install Ads, which don’t apply to all situations). As they all serve a different purpose, they’re complementary in that manner – Increase awareness with Right-hand Side Ads, increase user engagement with Image Promoted Posts and, further down the funnel, capture a user’s information with link promoted posts. 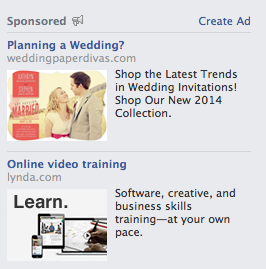 What other questions do you have about the different Facebook ad types? I’m more than happy to answer them – just tweet @social_allie. 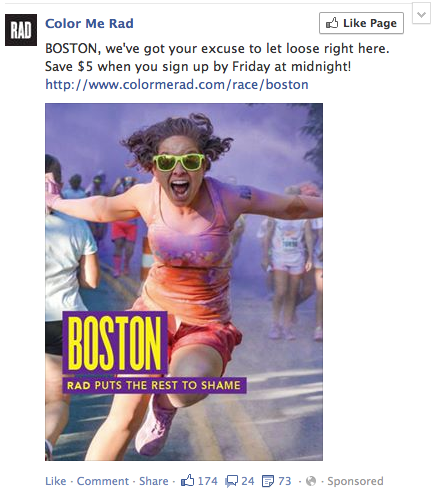 This entry was posted in Advertising, Facebook.